Taiyo Koki Grinding Machine Company, a DMG MORI company, the leading provider of vertical grinding machine solutions for aerospace, automotive, heavy equipment and tooling manufacturers, today announced the US debut of the CVG Series Vertical Universal Cylindrical Grinding machine with pallet changer. Available in three different part swing diameter sizes, 25.5” / 37.5”/ 53”, the machine is able to grind OD, ID and faces all in one part chucking with guaranteed machine roundness accuracy of less than .00004“. Twin opposing wheel spindles come standard, one larger heavy duty spindle dedicated to OD and face grinding (uses a 14” diameter wheel) and the other spindle is used primarily for ID and face grinding, both grinding spindles are high frequency. 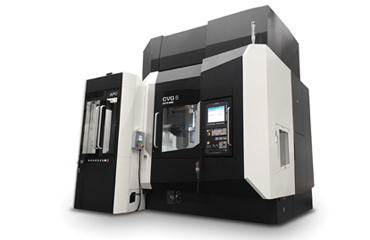 All CVG machines come with a 6 place ATC that uses the highly rigid HSK-E100 type quill clamping system. The large amount of stored and qualified wheels helps to reduce setup time and improve part quality as even the most complicated parts can be completed in one chucking. Grinding wheel loading and unloading is performed through the ergonomically positioned door in the side of the enclosure, just snap one in or out. Standard features include a Fanuc F31iB control with GriPS conversational software, twin opposing grinding spindles with 3-position turret, high frequency-liquid cooled grinding spindles, gap elimination, coolant system with integrated chiller and magnetic separator, X axis scale, hydraulic swing up dresser and a T-slot work table. The optional pallet changer brings unmatched productivity by significantly improving spindle run time, parts can be loaded onto a fixture outside of the machine while the machine is running. An available part clocking station with dummy spindle can be added which allows parts to be rotated and “clocked-in” at the part loading station. Multiple jobs can be ran simultaneously by registering and setting different workpieces outside of the machine which automatically selects programs and tooling for a different workpiece. Being able to run different jobs through the machine at the same time improves productivity / throughput. Precise measuring of ODs, IDs and faces can all be performed by the same device, the optional high precision measuring probe comes with its own high precision linear axis and uses a master calibration ring and fixture located inside the machine to compensate for any thermal change that might occur between part cycles. Multiple points can be measured lengthwise on the part, automatic size compensation feedback from the probe can be utilized for automatic size correction. Parts can be measured “in-cycle” which eliminates the need to rerun parts that are out of tolerance, scrap and the re-running of parts are all but eliminated. The machine can export measuring feedback data for quality tracking purposes. The CVG is compatible with both conventional and superabrasive type grinding wheels. A rotary disk dresser with acoustical sensor is optional and permits the dressing of vitrified CBN or Diamond wheels. The rotary dresser unit is direct drive and mounts to the hydraulic swing up dresser. Available options include: pallet changer, part measuring, B axis, C axis, rotary disk dresser, acoustic sensor for use with superabrasive wheel technologies, mist extractor, manual or automatic chucks.